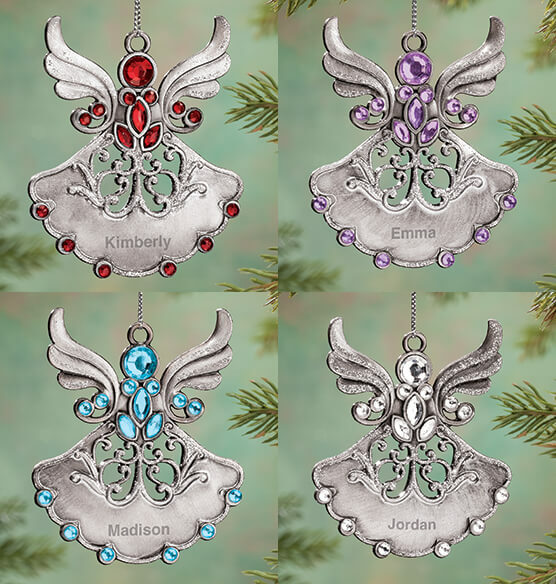 Lovingly personalized for your favorite "Earth angel", this Personalized Birthstone Angel Pewter Ornament also shines with your choice of birthstones for a truly special keepsake. 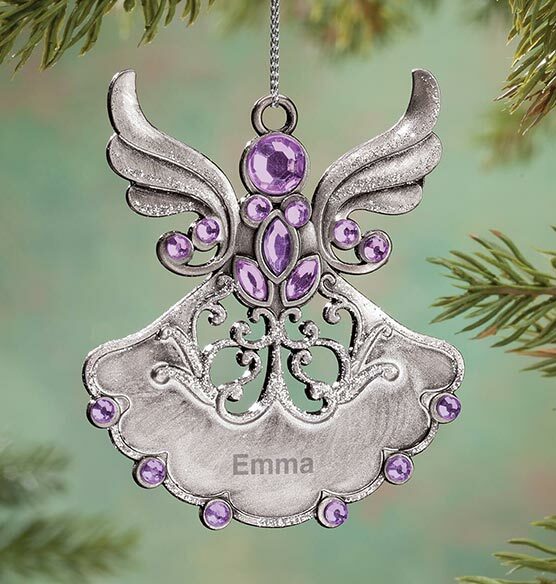 A thoughtful gift for Christmas, Baptism, First Communion or Confirmation, the angel ornament's 16 faceted birthstones shine through from either side, while silver glitter sparkles in front for a touch of shimmer. We'll print any name at no extra charge, creating a gift of sweet sentiment. Specify month. Specify name; limit 1 line, 10 letters/spaces. Metal. Christmas ornament measures 2 3/4" W x 3" H.
I plan to use the angel at Christmas. It is well made with pretty stones. It will enhance my Christmas tree this year. I would recommend it to a friend/s. 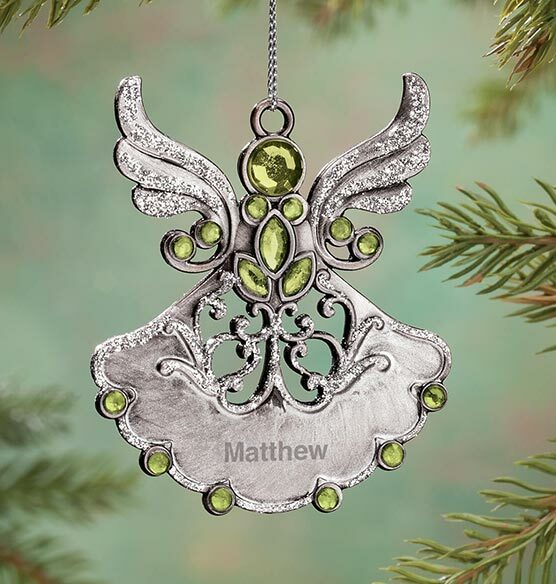 Love this ornament ! Have bought one for each of my four grandchildren ! As I've said in prior posts I simply adore the selection and quality of the ornaments. The personalization is perfection personified. This one is for a very special lil girl. I love it. I bought this for my granddaughter. She'll love it too. MY friend loves her angel ty for having such a ;pve;u gift. this was a gift for a dear friend who says it was too pretty to put on a tree she has it haning in her kitchen window she informs me an dlooks at it every time she does her dishes as we share the same birth month was why I chose ruby for the stone. 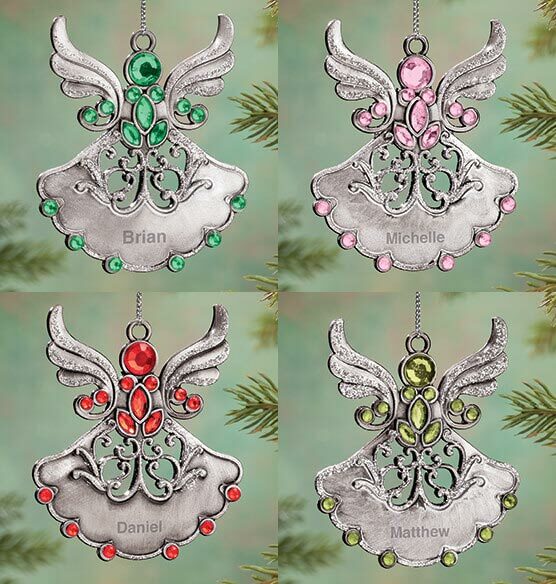 The ornaments were beautiful however I ordered 20 for gifts and 5 of the 20 had stones missing on the bottom of the skirts. I wrote to them but have only got confirmation that the email was recieved. It's 11 days before Christmas and these five ornaments are defective so not happy other than that seemed to be good quality. I got this ornament for my daughter for this Christmas. She loves it! It is so pretty and such good quality! She COULD Be An Angel!! I bought this as a message to my 4 year old Great-granddaughter. She's such a little "stinker" we're hoping she learns a few things from this angel. I know she's going to love it and it is beautiful with her birthstone showing up so beautifully. I'll give it to her after I get my hug from her........little stinker!!! 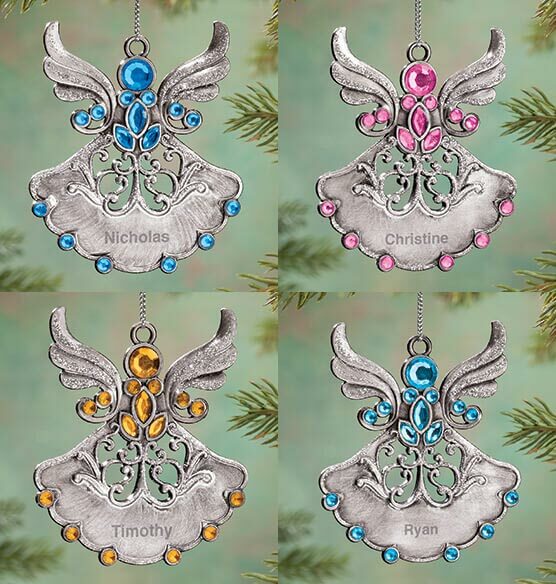 I must say ,I am a bit disappointed in these ornaments .. Out of the four ..three were missing "" crystal "
They were not in the bags or box .. Disappointing !! I picked this ornament for my daughter and her husband in celebration of their first Christmas as newlyweds. I work in the medical field and associated the angel with our staff members and the care they give to our patients. My sister has all angels on her Christmas tree. represents our grandmother who passed away. To give to my daughters and granddaughter for Christmas. you offered the memorial to our parents that I was looking for.